I’ve been to Little Deer Tracks a few times, but this was my second visit as a vegan. The first was for breakfast which was in pre blogging days. This time I went for a late lunch after a long morning of running around. I had remembered it fondly and my return visit proved I was right. There are probably more vegan items on the menu than last time I was there a couple of years ago. Just about everything on the menu is vegan or veganisable. Everything is vegetarian. I love that this café doesn’t even mention that it is vegetarian and vegan. I like to think that they are secretly converting the unwary with their delicious food. This time it was almost 3pm by the time I got there and I was Hungry with a capital H.
I went for some gnocchi made with potato and spelt flour. 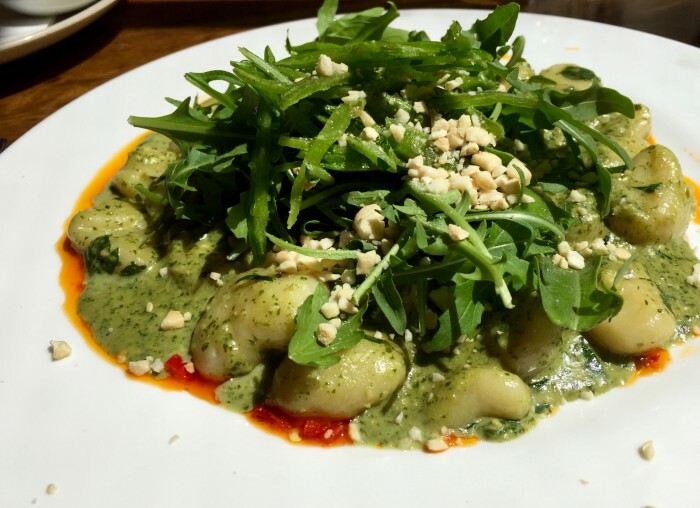 They had a choice of different sauces, I went for a macadamia and coriander pesto, with chilli oil, thinly shaved green beans and rocket, topped with some crumbled cashews. It was delicious and creamy and the gnocchi were light with just enough bite. The chilli oil packed a punch, enough to give me a few hiccups. It was so rich I probably could have done with a lime or lemon wedge to sharpen it up and cut through some of the creaminess. But that’s just being picky. It was really good. that looks great– I still haven’t made it there even though it’s been on my list for ages. Must go get that gnocchi! One of my faves. Plus free WiFi and friendly staff, not to mention pet friendly. Win win!